Available in Brass or Iron. One 90 Degree Turn will extend top and bottom Rod 3/4″. 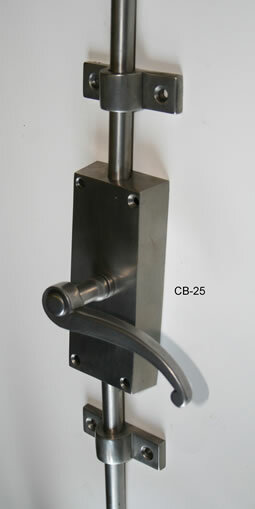 Cremone Bolts are used on Double Doors. Sometimes one Cremone Bolt for each door, Or one operable door will latch into door held Stationary by Cremone Bolt. CB-25 Cremone Bolt 2″ X 5″ box please specify rod length.